We’ve all seen businesses use testimonials in their marketing. It aids the credibility of the business to have someone say something good about them. And if the person providing the testimonial is credible to the reader/buyer/viewer/whoever then you are a long way along the road to a sale. One of the best users of a testimonial is Aaron Wall of SEO Book. I wrote about Aaron a little while ago when he used my testimonial on his own web site. I’ll show you how Aaron takes full advantage of a testimonial. Pat Carroll is one of our clients and has been for a few years. Pat was one of Australia’s best every marathon runners (PB of 2:09:39) and is a legend within the industry. Pat’s web site continues to grow and Pat has developed a fantastic resource for runners and members of his online runner coaching community. I’ve been trying to talk Pat into a redesign for a good while now but he loves that site! Anyway, Pat and I talk fairly regularly on web strategy and he’s always appreciative of our feedback. Pat has seen our ‘Brag Wall’ a number of times and was kind enough to contribute with the fantastic signed singlet you see here. So thanks Pat for the great gift. What I’ve done there is mentioned Pat’s testimonial like Aaron Wall does with my testimonial. That’s a great use of a testimonial. And, as a final bit, do you see how I’ve leverage Pat’s great testimonial/gift to us? Because Pat’s so well known here in Queensland (where we live) I can use him as a very authorative figure for my business. 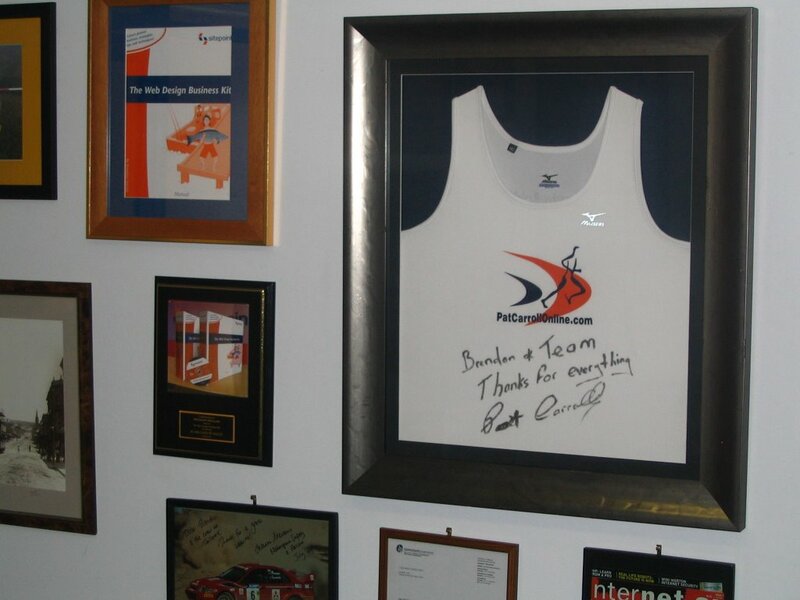 So not only does Pat’s gift hang proudly in the office, but I’ve just mentioned the testimonial on this blog and I’ll mention it in my online and offline newsletters. Because if people don’t know about someone’s great testimonial, then it’s as if we never received it.